Photographer: Jamie Nelson. Model(s): Marie K. Source: Marie Claire Russia. Makeup: Georgina Billington. Hair: Lacy Redway. Maria K starts the new year with a splash by Jamie Nelson for Marie Claire Russia, December 2014. Let the boom of beauty begin in this tectonic tale of color & creation. Lips of Bordeaux send us sailing high as ice blue eyes help us to reach the sky. Makeup Artist, Georgina Billington, captures the purity of passion as piattes take us down the path of potential. Jewel tones light up the page with body art that screams to be seen. 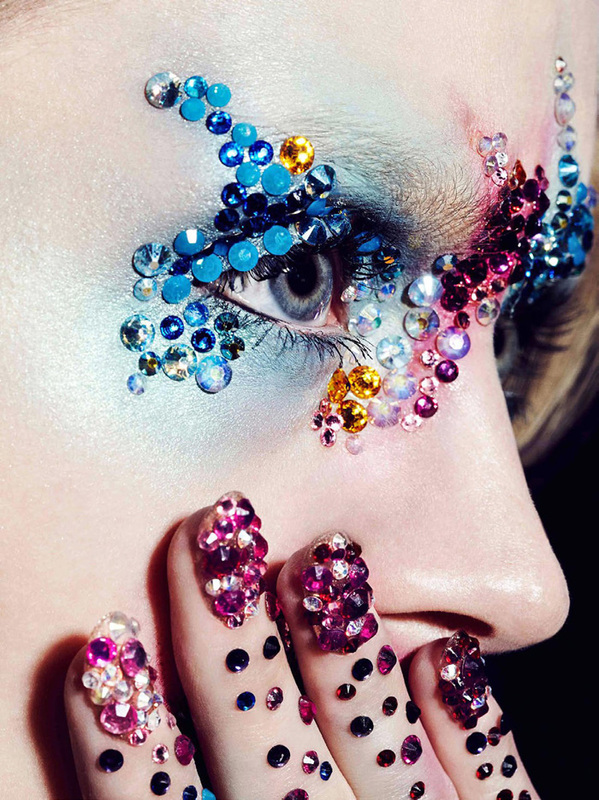 Bringing in a specialized hand model, Adele Uddo, plays the part with claws that are covered in multi-colored crystals. Dipped in ice the digits are divine, tipped in wonder they leave nothing behind. Manucurist, Julie Kandalec, evokes the finesse of finger-art, with hands that cup the breasts and clasp the corset. Blinged out and beautiful, the skin shines in this celebration of 2015 – HAPPY NEW YEAR!!!! !